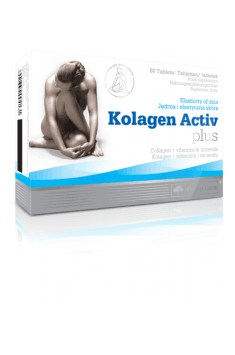 Olimp Kolagen Activ Plus is a dietary supplement with top-quality collagen, derived during enzymatic hydrolysis. In order to maximise efficacy, the formulation is enriched with a blend of vitamins and minerals. The supplement may be used for therapeutic and cosmetic purposes. It supports a healthy osteoarticular system, hair, skin and nails. It is recommended especially to individuals at risk of muskuloskeletal injuries and convalescents recovering from injuries. Collagen is a kind of fibrillar protein which is a component of nearly all bodily tissues and organs. It is synthesised naturally in the body and its greatest amounts are found in the skin, joint cartilages, bones, tendons, ligaments and retina. It has several vital functions in the body. It functions primarily as a building block, i.e. it is responsible for maintaining dense, elastic and strong connective tissues. In addition, collagen influences the development of organs, helps repair tissue damage and is critical to wound healing. It shows also the ability to interact with different receptors responsible for cell proliferation and adhesion. Vitamin B6 and C promote collagen production. Vitamin C is critical to the conversion of procollagen into collagen. Its deficiency may contribute to losing biological and mechanical properties of collagen, thereby impairing the quality of the skin, joint cartilages and blood vessels. Vitamin B6 is involved in the synthesis of peptide chains and collagen maturation. Studies on animals have shown that its deficiency is correlated with a decrease in collagen levels in the body. Calcium and magnesium are key elements for osteoarticular health. They have synergistic effects, are critical to bone mineralisation and development and contribute to a healthy cartilage and muscular function. Collagen accounts for 90% of the organic bone matrix and that is why the health of the muskuloskeletal system depends on the amount of collagen and its normal formation. Taken as a supplement, it has a beneficial impact on bone turnover, may boost the mineralisation of bones and improve their density. It is a valuable element in the prophylaxis and treatment of osteoporosis. Collagen supplementation is recommended especially to individuals with joint inflammation and degenerative disease. Studies have demonstrated that replenishing collagen helps increase mobility in affected joints, relieves pain and reduces joint stiffness. It may even stimulate chondrocytes into repairing damage to the cartilage. Collagen is also used in sports supplementation. It strengthens the musculoskeletal system which is overloaded with intense physical activity and increases the endurance of joints, tendons and ligaments. It may reduce the risk of injuries and helps achieve complete recovery. Skin, hair and nails are other elements that can benefit from supplementation with collagen peptides. Collagen helps restore a youthful appearance, improves skin firmness and smoothness and reduces small wrinkles. It influences beneficially hair density and elasticity, speeds up hair growth and reduces hair growth. It is also recommended for weak and brittle nails. Collagen may be used for post-injury recovery. It speeds up wound healing and prevents the formation of scars over the wound. Type III collagen is especially crucial to scarring because its deficiency promotes the accumulation of scar tissue. Ageing of the body is associated with decreased endogenous synthesis of collagen. What is more, the quality of collagen produced in the body is impaired and its fibres become thinner and stiffer. It has a negative impact on the quality of connective tissue. Oral collagen administration in the elderly may slow down adverse processes which affect the cytoplasmic matrix. It improves the quality of life and helps maintain a healthy osteoarticular system. It influences beneficially the quality of the skin and makes the signs of ageing, such as wrinkles and loss of elasticity, less visible. To sum up, Olimp Kolagen Activ Plus is a good way to strengthen the musculoskeletal system and improve the quality of the skin, hair and nails. Solutions adopted by the manufacturers maximise the supplement’s efficacy. The supplement will be perfect for physically active individuals. 4 tablets 2 times a day between meals. The preparation is recommended to people performing intensive and regular physical activity in order to limit injuries and facilitate regeneration resulting from joints strain. It may also constitute supplementation of hair, skin and nails care. Bulking agent - sorbitol; maltodextrin, acidity regulator - malic acid; anti-caking agent - magnesium salts of fatty acids; fragrances; sweeteners - acesulfame K, sucralose.